Compro delivers C4Home, a new cloud platform for your IP cameras. Do you know how cloud and IP camera are changing the security industry? What is Video Surveillance as a Service (VSaaS)? C4Home, a cloud platform is the answer to the above and enables manufacturers to tap into more market segments. 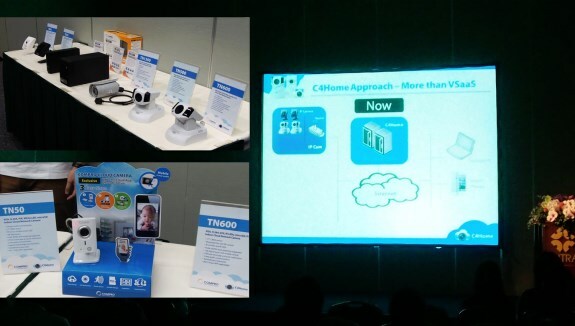 Compro Technology, a leader network camera, held a great seminar to show-cased the C4Home platform and unveiled the TN-series of home IP cameras during the period of COMPUTEX TAIPEI 2013. C4Home cloud platform empowers users with a new digital lifestyle with access anytime and anywhere technology. It combines the best of both worlds by integrating video surveillance and home automation under a single APP. C4Home is more than a traditional VSaaS, it is a platform is built with OPENNES in mind, which allows us to integrate cameras, security sensors, home automation devices, NVR and e-health devices. 2. True Mobility: Users are able to communicate (listening / speaking) directly from their cell phones, anytime, anywhere. 3. Intelligent Camera with Notification: The camera is on constant watch for any suspicious activities and will send out push notifications should they be detected. 4. Split Screen Viewing: Users will be able to view four cameras simultaneously on Android smart phones. 5. Keep it personal: Each of the cameras can be individually configured from smart phone to broadcast the video or not. For example, you can turn off the camera if you were at home and be assured that your privacy is kept. 6. HD on the Go: Users now have the ability to view 720P HD video on smart phones when coupled with a supported camera, e.g. TN90. 7. Cloud Storage: The C4Home smart phone APP had included DropBox support so the important snapshots can be saved to cloud immediately after events happened. TN30: The entry level MJPEG VGA day & night camera, targeted at the first time buyers. TN60: The advanced H.264 VGA day & night camera, a feature-rich cube camera for those who wishes to retrieve local recordings on cloud. TN90: A 720P HD day & night camera for the enthusiast, offering all the bells and whistles, including 720P H.264 video, day & night vision, PIR sensor for human detection. The TN-series of IP camera is available from June 2013.